I am working at the office today; the Prudential Terry Horrocks Real Estate Agency, in the Village of Lake Placid. This is a blog about the Adirondack Lifestyle and what it is like to live here. (Pretty nice.) So far, I've focused a fair amount on the great outdoors and all the wonderful opportunities we have to play outside. For example, skiing is superb right now. 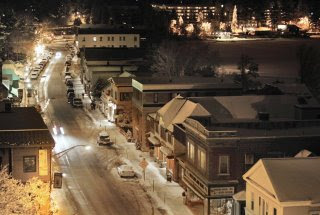 Lake Placid also has an awesome downtown and is technically a village. There is excellent shopping on Main Street, including outlets like Gap and Bass, a beautiful EMS retail store, and small clothing boutiques that carry lovely resort lines. The Village is centered around Mirror Lake, a sparkling clean lake that freezes over and is maintained and lit for skating in the winter. If you visit, plan to take the nearly 3-mile 'walk around the lake,' on our red brick sidewalk that, as one might imagine, circles Mirror Lake. Residents, vacation home owners and visitors can enjoy concerts in the band shell park, shopping, playing on the lake, fine dining or a mug of famous Ubu Ale, all within a three mile stroll. Here are some photos of the alpine resort, Village of Lake Placid. We have a number of very nice listings within walking distance of the village. Let me know if you would like to have a tour.